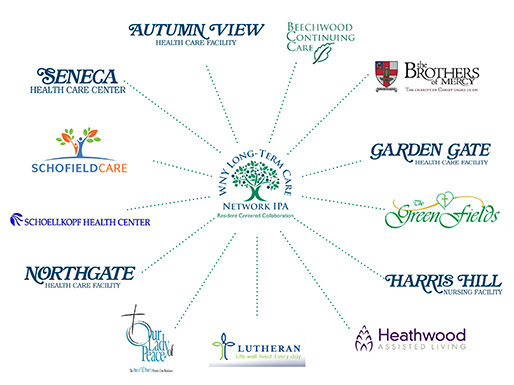 WNY IPA's members provide a broad array of services across the health care continuum. From in-home programs that allow individuals to remain independent for as long as possible to 24-hour skilled nursing care for those requiring assistance at all levels of care. Our organization was formed under the guise of embracing ongoing health care reform and aligning our members to be a part of the solution for improving quality care to the population we serve. Specific Levels of Care Below are descriptions of the various types of services offered by our member affiliates. Adult Day Care - non-residential care that supports a variety of needs including health, nutrition, socialization and daily living needs in a professionally staffed setting. Alzheimer's/Dementia/Memory Care – providing care to individuals with memory impairments and their caregivers through in-home services, dedicated units, specialized programming and support services. Assisted Living - long-term senior care options that provide personal care services such as meals, medication management, bathing, dressing and transportation. Home Health Care –a wide range of health care services that are provided in the home setting to treat an illness or injury. Hospice/Palliative Care – programs designed to complement an individual's plans and desires while meeting the physical, emotional and spiritual needs for end-of-life care. Outpatient Rehabilitation – therapy services that compliment the healing process and help individuals return to their normal daily activities as quickly and safely as possible. Respite Care – short-term care, generally ranging from 3 to 30 days that allows caregivers to tend to personal business with peace of mind knowing their loved ones are safe and well cared for. Retirement Living – living accommodations for independent seniors that can often include apartments and patio homes. Some ancillary services may be available to residents. Skilled Nursing Care – services include long and short-term care for individuals who are faced with serious health issues, are in need of rehabilitation services or require assistance with activities of daily living. This level of care is regulated by the Department of Health and is more intense than that found at an assisted living level. Subacute Rehabilitation – short-term, rehabilitative services that utilize a combination of therapy and nursing care, along with specialized equipment to facilitate healing after an illness, injury or surgery such as a joint replacement. This can include physical, occupational and speech therapy as well as training for activities of daily living.